This agreement provides a very thorough framework for the shareholders of any private company to set out the precise structural management of their business. It covers the provisions that will be important to owners of most private companies. 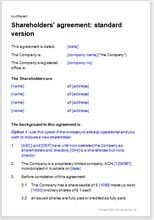 This template is our full standard version, suitable for most proprietary limited companies regardless of the industry of the business or the number of shareholders. It could be put in place by a majority or a minority shareholder when the company is formed, or at any later time, for example, on change of ownership or when a significant debt investment is made or repaid.